The Nationwide today announced that nominally the average UK house now costs £164,389 which month on month is a fall of £1,349 or -0.8%. Year on year the fall is £4,341 or -2.6%. Nominally this puts prices back to levels last seen in mid 2006. 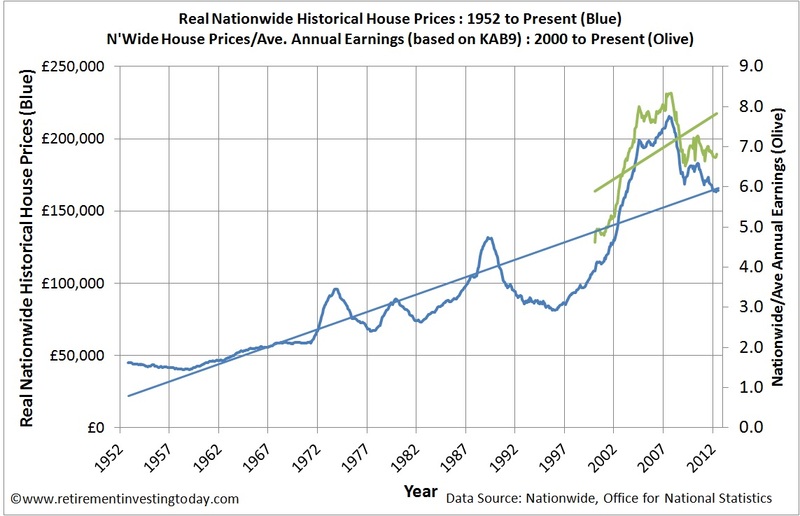 Looking at the Nationwide Historical House Price dataset in inflation adjusted terms (Chart 1), to account for the devaluation of sterling, it however tells a very different story. This tells us that year on year real prices are down £9,006 or 5.2%. By this measure UK house prices are back to levels last seen in May 2003. A common metric used to get an indicator of potential stock market value is the Price to Earnings Ratio (P/E). I carry this theme through to housing and also show this in my first chart. This shows that today we are sitting on a P/E of 6.8. While being a long way off the peak value 8.3 we are still also a long way off of the 4.6 seen in January 2000. It is this valuation that keeps me on the sidelines of UK house ownership and instead my family lives well below our means in rented accommodation. 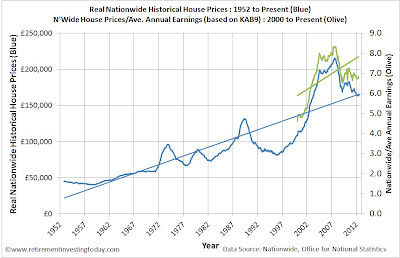 Unfortunately, unlike share markets, I no longer think that valuation is a key driver of UK house prices. This is because I am now leaning towards house prices being driven simply by house affordability. I started down this road in a previous post. This means that the average house purchaser will not think or calculate how much a house is worth, but instead just ascertain how much can be borrowed. To enable us to track affordability over the coming months, as with everything on Retirement Investing Today, I need to develop a dataset to reflect this. 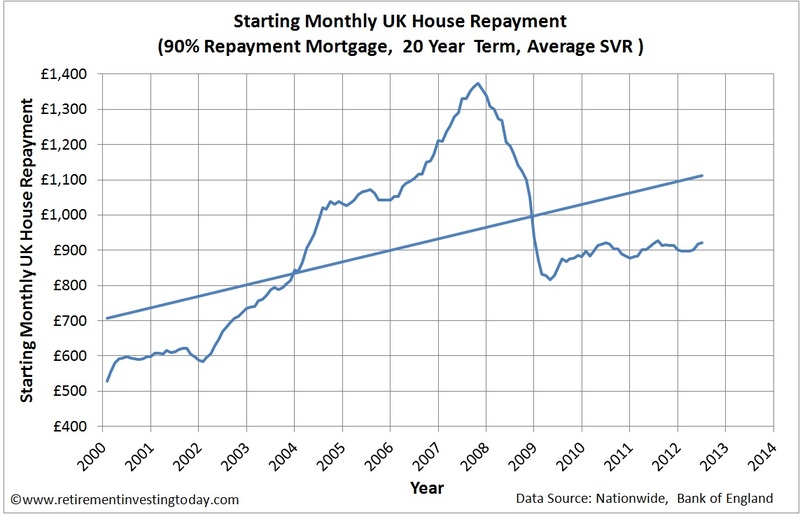 This is the focus of today’s post and I am going to define this dataset as the Ratio of Average UK Monthly House Repayments to Average UK Earnings at the point of the mortgage being granted. That’s a mouth full so I’ll call it the UK House Affordability Ratio. 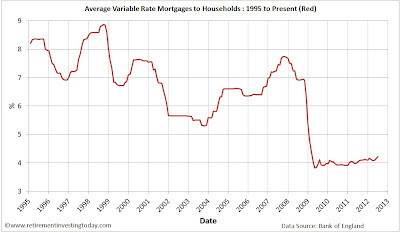 To enable us to calculate this ratio we must therefore bring another variable into play which is UK mortgage interest rates being charged on mortgages. The proxy that I will use for these mortgage rates is the Bank of England statistic IUMTLMV which is the monthly interest rate of UK resident banks and building societies sterling Standard Variable Rate mortgage to households (not seasonally adjusted). A history of this dataset is shown in my second chart. Today it stands at 4.22% which month on month is up 1.7% and year on year up 4.7%. 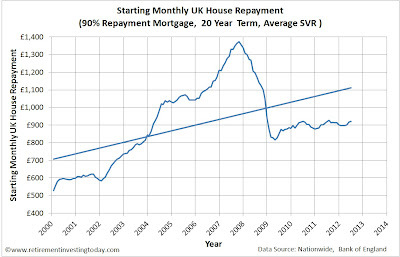 Armed with the Nationwide dataset, average mortgage rates along with assuming a 20 year mortgage and a 90% repayment mortgage (the actual value isn’t overly important as it is held as a constant through the dataset for comparison purposes) we arrive at my third chart which shows the starting monthly repayment amount. 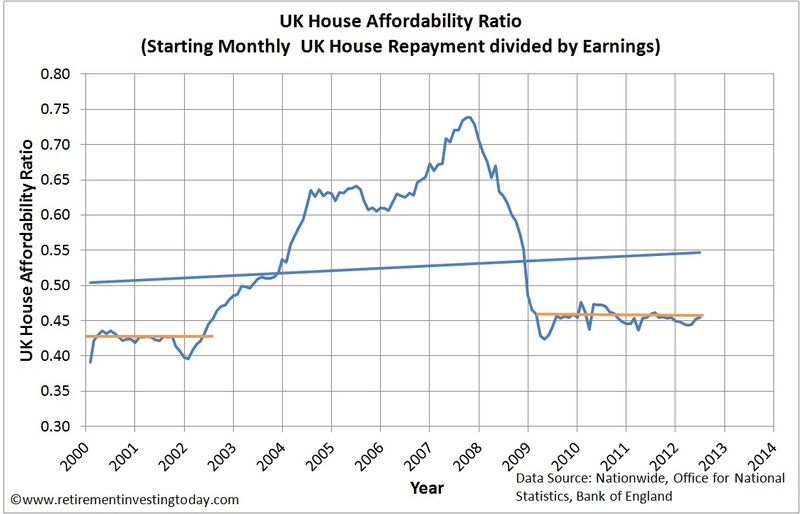 We can then ratio this with Average UK Earnings to arrive at the UK House Affordability Ratio. Even at this early stage this data looks interesting. Remove the credit boom and affordability seems almost like a straight line (the orange lines). This implies that house price falls will only continue if interest rates continue to rise. 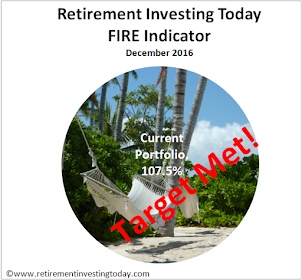 As always I would welcome reader’s views particularly as this is such a new dataset for Retirement Investing Today. Note: Readers interested in UK House Prices may also be interested in the Greater Fool UK House Price Index which has also been developed quite recently. - The proxy used for Average UK Earnings is the ONS KAB9 dataset. - The Inflation corrector is the Retail Prices Index (RPI) with July 2012 being extrapolated. Most UK borrowers would not think much about rates rising and would have little understanding of how much of a difference a rise would make when rates are so low. So this is not the British public going long on low rates, rather it is people blindly piling into property just as they have done for 20 years. "This implies that house price falls will only continue if interest rates continue to rise." Though it can be observed,counter-intuitively, that house prices tend to rise as rates rise, and tend to fall as rates fall. > "The Nationwide today announced that nominally the average UK house now costs..."
Would it not be more correct to say that the Nationwide index tracks approved mortgages, rather than the actual cost of a house - subtly different things? I ask not as a criticism, but simply because I want to get my own understanding in order. > "the average house purchaser will not think or calculate how much a house is worth, but instead just ascertain how much can be borrowed"
Yes! The general hordes buying houses do not think like savvy investors - they're even less rational than that! They will always tend to shoot for the most expensive house they can get their hands on, and won't think far beyond their first mortgage payment. Couple that with the fact that a straw poll of friends shows that lenders are - despite reports - still lending ridiculous, unrepayable mortgages, and I can only conclude that the housing market still shows strong bubble characteristics. I agree fully. I believe the vast majority simply borrow as much as the bank will lend them today. They then worry about tomorrow, tomorrow. Could that be because the are more often than not behind on what is really happening in the economy? Yes I was a little lazy with my terminology and I'll hopefuly remember to clean it up when I post the next monthly update. Importantly though it does not track approved mortgages either as the mortgage will typically be a percentage of the price paid. Nationwide claim "the monthly figure measures the mix adjusted average house price for all houses in the UK" however of course we know this will not be exactly the case as they only have house price information derived from Nationwide mortgage data available to them. Have a look at the second chart in the Greater Fool UK House Price Index post which averages the Halifax and Nationwide and compares with the Land Registry. There is a gap but the trends are there and the advantage the Nationwide and Halifax bring is that we see what's happening 3 months before the Land Registry. It would be great if the Rightmove data was sensible as that would be 3 months before the Halifax/Nationwide and would be about as close to the pulse of the market as you could get. However the Greater Fool Index shows us that the vast majority of Rightmove listing must be simply kite flying so can't be trusted. Regarding your point. I agree fully and it's why I believe that it is now all about affordability and not value. Thanks, for the anecdotal evidence regarding lenders behaviour. 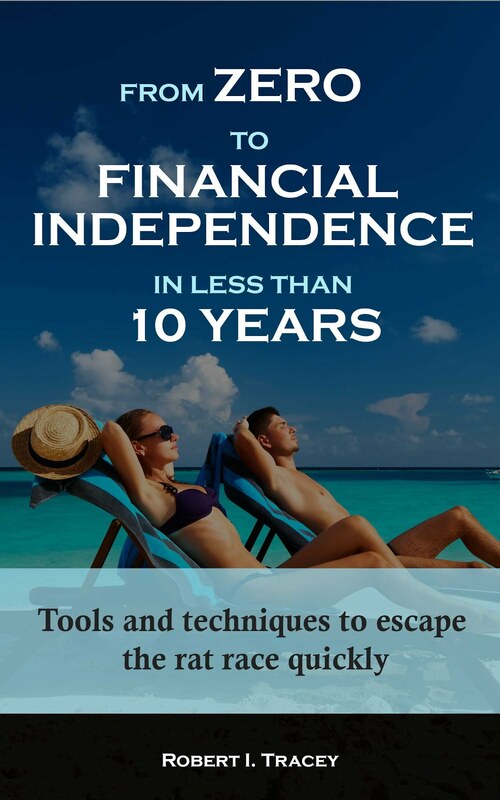 Good feedback for other Retirement Investing Today Readers. Do any other readers have any anecdotal evidence of pricing, affordability or lending criteria that they would be prepared to share with readers? 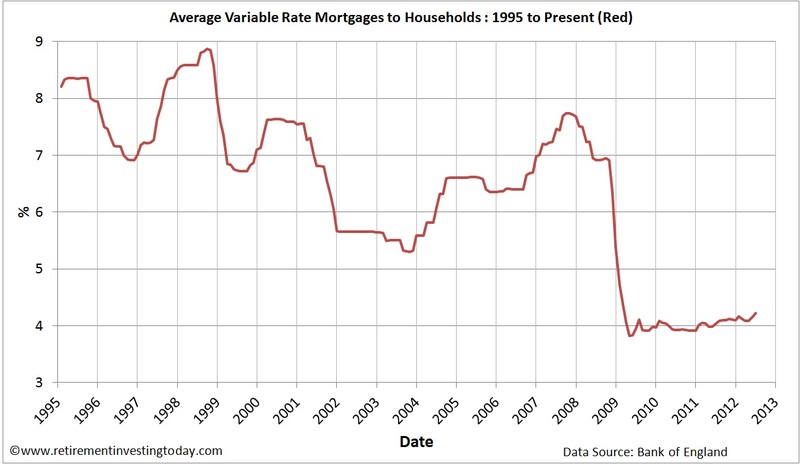 even though repayments on a mortgage is very low as a % of earnings due to interest rates being low I'd be interested to see what the % paid back was over 25 years or so as compared to earnings over that period ... I suspect it may be a scary figure now. 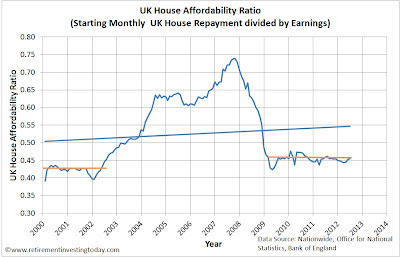 e.g I may only be paying back 20% of my salary as mortgage payments but salaries just arent increasing - so the payment over 25 years now is relatively much greater than say the 70s when interest rates where higher.. i.e. in 25 years time assuming interest rates dont rise (!!!) I'll still be paying back about 20% of my income.... in previous generations that may have reduced to about 5%! OK, old post but hopefully others will revisit. 4. So for anyone 'locked in' by buying in this latter period (and so buying at a higher p/e ratio) their affordability ratio can only go higher...assuming that they do not have a fixed rate for the entirety of the mortgage. Have I got this correct?...as your method seems to be far more enlightening that merely looking at the house price/average wage ratio.